The room presented by importer Vana LTD of Lake Grove, New York, featured (in addition to some record cleaning fluid and Okki Nokki record-cleaning machines) analog components by the European Audio Team (EAT) and loudspeakers by Audio Physik. 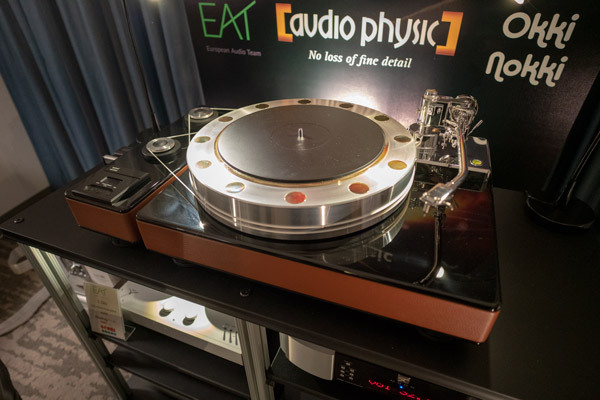 I was also smitten, in the Vana room, by the E-Glo Petit phono preamplifier ($1495). It’s an attractive, hybrid device with flexible, easy loading, featuring JFETs and two 12AX7 vacuum tubes. It looks like a miniature version of the full-on, 6-tube E-Glo, which sells for $6995.